Your resume is your first opportunity to make a good first impression, and you don't have much time to make that impression. According to U.S. News & World Report, it takes less than 20 seconds for a hiring manager to make a decision about you based on your resume. Hiring managers need to scan your resume and find the information they need in record time so they can move on to the next resume. What that means for you, is that nearly every word you include on your resume can either help get you noticed or knock you out of contention. Know which words to include in your resume, and which to avoid, to impress the hiring manager quickly. Include action verbs throughout your resume, particularly in the work experience section of your resume. Employers want to know what you can offer the company, and action verbs show exactly what you have accomplished at previous companies. “Achieved” is a terrific action verb that shows that you have succeeded at a previous task. This makes employers feel confident that you can achieve similar things at their companies. Improved is another useful action verb to put in your resume. This word shows that you made some sort of positive difference at a previous company. If possible, explain how you made the improvement. For example, you might say “Improved efficiency of administrative office by streamlining physical and digital file systems.” This will show not only that you achieved something, but it will also show the skills you used to achieve it. Words like “trained” and “mentored” are action verbs that show you have experience managing others. These words are particularly useful if you are applying for a job that involves managing, leading, teaching, or advising others. If possible, state the number of people you trained or mentored. For example, you might say, “Trained staff of 15 baristas to operate new cappuccino machine.” This will demonstrate your ability to lead and mentor a group of people. Like “trained” and “mentored,” “managed” is an action word that shows your ability to lead others. This is a particularly important word to include in a resume for a management position. Again, try to include the number of people you managed, particularly if it is a large number. This action word shows that you can do more than just follow instructions—you can actually construct something and contribute to a company. Whether you developed a new filing system or invented a software app, use the word “created” to show your independence, initiative, and originality. Employers want to hire candidates who can recognize and help solve problems. Use this action verb if you are applying for a managerial job, or any job that requires supervising others. This word will show that you are able to spot a problem and step in to solve it. This action word demonstrates your willingness to step up and help with a project or task, even if you are not asked to do so. Use this word to show your initiative and your teamwork. Employers want job candidates who are capable of encouraging and persuading others for the good of the company. An action word like “influenced” demonstrates what you have achieved while also highlighting your leadership skills. Employers typically want to know that job candidates are creative, innovative people who will bring new solutions to the table. In your resume, include examples of times you develop a particular idea, either on your own or as part of a team, and explain how that idea helped the company achieve success. If you are applying for a job as a manager, you might mention how you listened to your employees’ ideas, and helped them develop those ideas into something that benefits the company. This will show your delegation skills as well. This action verb demonstrates that you are able to successfully complete a project. Whether you launched an app that you developed, a website you helped design, or an advertising campaign that you worked on with a team, the word “launch” will show that you are able to produce something successfully. Again, employers will want to know how you have added value to previous companies you worked for. One way to do this is to demonstrate how you made money for a company. Include any examples of times that you helped increase profits or revenue. Using numerical values as well as the words “revenue” or “profits” will show the hiring manager, at a glance, that you have a record of achieving financial success. Like “achieved,” the action verb “won” shows a hiring manager that you have been successful in previous jobs. If you ever won an award at work or received some other recognition for your efforts, consider using this verb. “Best of breed” sounds more like an American Kennel Club dog show winner than a candidate for employment. Avoid cliché and awkward phrases like this in your resume. Once a phrase becomes too common, it does not mean anything to a hiring manager. This is another empty, cliché term. If you are using this word to say you take initiative, delete this word and replace it with a specific example of a time you stepped up and took charge of a project. Examples are much more powerful than empty words. Synergy might sound like a trendy term, but hiring managers often find it vague. Use more specific action verbs to specify what you are trying to say you accomplished. Did you “interact” or “cooperate” or “collaborate” with a variety of departments? Use one of these action verbs to clarify what you mean. This is another overused and vague phrase. Rather than using this word to describe yourself, think about what you really mean. Were you the person who delegated everyone’s responsibilities at your previous job? Were you the person people went to when they needed help mediating a conflict? Provide specific examples of how you demonstrated leadership, rather than using this term. This phrase is very broad and unclear. If you are trying to say that you helped come up with a number of ideas for an organization, use an action verb like “influenced,” “created,” or “developed” instead. Again, it is a terrific idea to show how you added value in your previous jobs. However, rather than use the phrase “value add,” show specifically how you added value. Include numbers whenever possible to quantify your success. Use words like “increased/decreased,” “revenue/profits,” or “under budget” to specify how you added value. Employers assume everyone wants to achieve good results at work. Replace this empty phrase with evidence of how you successfully achieved results at work. For example, if you work for an online marketing company, you might mention how you measure click-through rates to measure the success of each marketing project. Almost everyone says they are a team player, but it is hard to prove this. Instead of using this commonplace description, give examples of times that you collaborated with others, using action verbs like “cooperated,” “collaborated,” “mentored,” and more. Again, employers want you to quantify the ways you achieved success in your previous jobs. Rather than using an unclear phrase like “bottom line,” use numbers to show how you specifically helped the company. Whether your company’s bottom line is number of sales, budget, or some other figure, be specific. Rather than say you are a hard worker, prove it. Use specific action words and examples to demonstrate how you have worked hard in the past. Only by using examples will employers be able to believe your statements. This adjective describes your personality rather than your work ethic or skills. There is no way to prove your outgoing personality on a resume—anyone can put the word “dynamic” on their resume. Stick to information that you can prove using examples from past work experiences. In your interview, the employer will be able to see your energetic personality. Like the word “dynamic,” anyone can say they are “self-motivated” in their resume. However, using the word doesn’t prove anything. Instead of saying you are self-motivated, you can prove it throughout your resume. In your work summary, mention a project or achievement that you developed yourself, or that you volunteered to do. If you joined any professional association, list them on your resume. These are the things that will prove your motivation. One of the worst (and most common) mistakes you can make on a resume is to say you are detail-oriented, and then have a spelling error in your resume. Get rid of the overly used term “detail-oriented,” and instead produce a polished and well-organized resume. This will show your attention to detail If your past work has required you to be detail-oriented, explain that in your description of your work experiences. For example, you might say “Awarded Store Clerk of the Month three times for cash-handling accuracy. Be specific. You do not want to appear vague in your resume. Hiring managers are tired of hearing clichéd words like “team player” and “hard worker.” Avoid these phrases at all cost. Include words and phrases that explain specifically what you accomplished in your previous jobs. Use actions. Hiring managers also like to see action words in resumes. This is key. Action words demonstrate that you took a leadership role that produced results. Include power words. Include power words in your resume—words that hiring managers look for that will make your resume stand out. Along with action words, other power words include popular skills words, buzzwords, and jargon specific to your industry, and keywords from both the job listing and the company website. 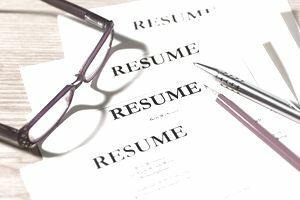 Use these (without using them too often) to make your resume stand out as the hiring manager skims through it. Use values. Also, when possible, use numbers to demonstrate how your efforts benefited your employers. For example, instead of simply saying you “added value to Best Practices PR by saving money,” you should say that you “administered a public relations budget of $500,000 and, by developing and implementing an innovative and efficient cost-saving marketing program, saved Best Practices PR over $10,000 a year for a period of three years." Focus on the job. By focusing on the skills, results, and accomplishments most aligned to the job you're applying for, you'll have a much better chance of getting called in for an interview. Again, using keywords from the job listing will help align your resume with the job. This, coupled with word choice, will get you closer to your next job.